He is bold and brash. He is loved by his fans and hated by his enemies. But one thing that cannot be disputed is Conor McGregor has become rich, very rich. Whatever you think of the UFC mixed martial arts fighter from Crumlin, Ireland, you cannot question his meteoric rise from apprentice plumber to two division champion of the world. Behind the trash talk, the secrets to his success lie in plain view. Here at Investormint, we examined traits of Conor McGregor to uncover a blueprint to his success. Perhaps the most influential self-help author of all time is Napoleon Hill, who challenged his readers to create a definite major purpose in life. He claimed that 98% of people had no firm beliefs, which put success out of their reach. The notion that “if you can conceive an idea, and truly believe it then you can achieve it” is a core principle required to succeed according to Napoleon Hill. “if you can see it here (pointing to his head), and you have the courage enough to speak it, it will happen”. Gloss past that statement in a hurry, and the power of it can be easily lost. There is no need to step into Conor McGregor’s shoes to conceive of the courage needed to face the world’s media and proclaim yourself the best fighter of all time. Simply think of a goal you want to achieve that may seem unrealistic, and imagine the courage it takes to speak it fearlessly among friends, on social media, and to strangers. How easy would you find it to take the plunge and start the journey to realizing your long-held goals? When you share your goals in social situations, you create what Robert Cialdini calls a commitment device in his famous book, Influence: The Psychology of Persuasion. According to Cialdini, when you commit to a goal, you are more likely to honor that commitment, because otherwise your self-image may be tarnished. For example, if your motivation changes or the incentive to reach your goal is removed, you will still keep going so as to honor the commitment you made publicly to others. Following through on your commitment to others leads to a congruent self-image. A key attribute of highly successful people is to focus on a single goal. Walk through the average person’s day and it will involve waking up to some breakfast, going to work, coming home, watching a little TV, perhaps enjoying some exercise, and sleeping. But what if every part of every day was focused on a single goal? 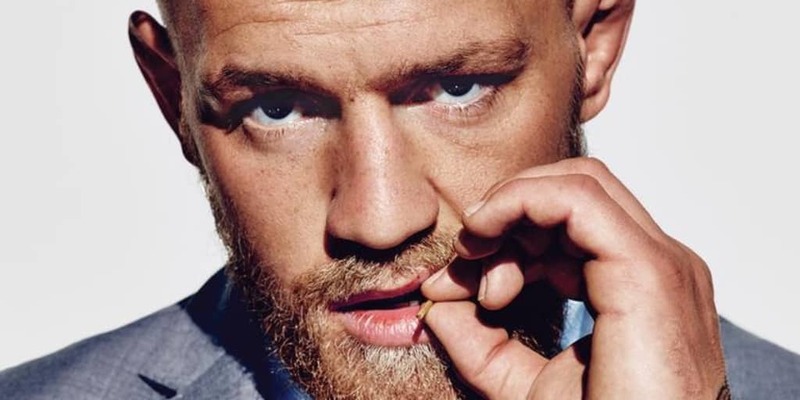 For Conor McGregor, the food he eats affects his performance, so he is disciplined in his eating habits. His training regimen is his work, so he focuses on every aspect of improving his performance by working not only with wrestling, jiu jitsu, and boxing coaches but also with Ido Portal, a movement and fitness coach. In this tweet, Conor McGregor captures how every day his attention is focused on becoming better at his craft of mixed martial arts fighting. After you have chosen your Definite Major Purpose, how much faster will you achieve your goal if, every second your day, your brain is focused on turning your goal into a reality? Focus becomes second nature when you practice it again and again. Another way of saying that is: becoming focused is easy when it is a habit. If you haven’t already read Stephen Covey’s bestseller, The 7 Habits of Highly Effective People, it’s worth every moment of your time. No worthy goal is achieved without setbacks along the way. Whether building a business, climbing one of the peaks in Nepal, or graduating college, failure is the fate that every conqueror must overcome. McGregor has suffered injury setbacks, defeats, and failure too, but he has bounced back stronger than ever each time. And his coach, John Kavanagh, has perhaps the simplest yet most powerful philosophy to confront and overcome failure: Win or Learn. You get a glimpse into a mindset of a person who doesn’t fear failure. Many worthwhile adventures never see the light of day because the adventurers feared failure. The fear of what people will think of you if you fail. The fear of taking a risk and not succeeding. The embarrassment among friends. It is easy to be afraid if you interpret failure to mean losing. But by changing the paradigm in your mind where failure means learning, you re-frame what most people think of as a negative into a positive. When you begin to interpret what others perceive as failure as a chance to grow, learn, and reach success faster, you lose your fear and accelerate your journey towards reaching your goals. Love him or hate him, Donald Trump is a master of thinking BIG. He was still in his twenties when his aspirations to change the New York skyline were conceived and became a reality. Thinking BIG was so integral to his success that he wrote a book about it. If you imagine for a moment how audacious a goal it is to build skyscrapers in one of the most competitive cities in the world for developers, and translate that to your own life’s objectives, you will set the bar just a bit higher. “I’m going to change the way mixed martial arts is viewed. In the Magic Of Thinking Big, David Schwartz walks you through how to create big goals, and how to achieve them for even greater success. Whatever your goal, challenge yourself to think even bigger, shoot for the moon! A team is needed to succeed. Some team members will have mundane jobs but they contribute to success in their own unique way. Be grateful to them. Show them your appreciation, even if it’s a simple thank you. For Conor McGregor, a simple tweet is his way of expressing gratitude to someone who makes his life a little bit easier. In this case, Irene gets plaudits for keeping his home in pristine shape. Author of the best-selling worldwide phenomenon, The Secret, Rhonda Byrne believes expressing gratitude is so critical to success that she created The Secret Gratitude Book to provide a framework for practicing the power of gratitude every day with the goal of attracting the magnificent things you want in your life. Finally, whether you’re Conor McGregor trying to become the Champ, Champ two division mixed martial arts world champion or you’re looking to start a venture and trying to figure out how to get rich like Conor McGregor, there is no shortcut to success that lets you skip the hard work. Hard work. Grit. Determination. Waking up on the cold mornings and going for the jog to train for the marathon when it’s easier to stay in bed. Grinding out the night shift because the deadline needs to be met at work. Reaching out to that extra person to grow your business. Whatever the goal, you have to summon the inner resolve to keep going when it gets hard. To make sure you stick with it, know why you are doing what you are doing. With a clear purpose, you will have a clear sense of direction, and a reason to continue when times get tough.